Radon reduction in upstate N.Y.
Air flow is good over shallow depth of stones over bedrock. Manometer reads constant .45 w.c. Well sealed sump basin in background. Noise is very manageable through pipe tucked in front corner of closet. Perhaps more support strapping than needed. Try to keep the fan level. Tests in 2006 and 2007 showed radon levels in our 1955 Ranch in Ithaca, N.Y. were between 3.5 and 4.7 pCi/L . Lung cancer took my mother-in-law's life in 2010 (and previously, her sister also). 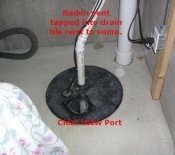 When my mother-in-law's home was sold we learned her home's radon levels were near 13 pCi/L. We knew we better take action to reduce our home's radon levels. Following guidelines at Indoor Health Advisor and a few emailed questions to Val (promptly answered) we managed to get our mitigation system working nicely this Fall. Some notes on the project: Fortunately, our air flow communication smoke test demonstrated very good air flow under our large full basement. 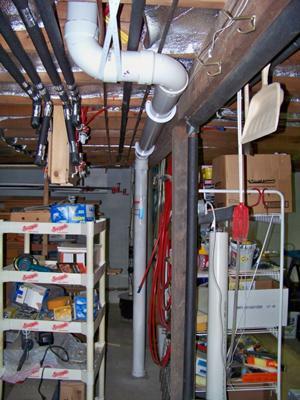 Learning that, allowed us to place only one 4" pipe through the basement floor and use a RP-140 low wattage fan for energy savings (and it is quiet). Only a very slight whisper of sound can be heard from the PVC running through my son's closet up to the attic. 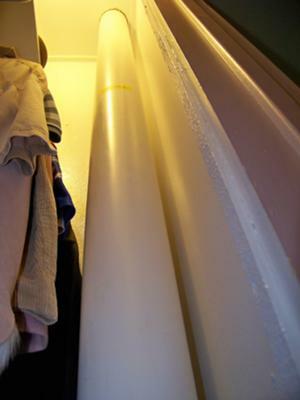 I used cell core PVC through the closet after a tip that it may suppress sound better than standard PVC. 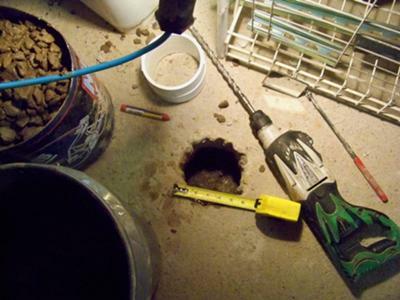 A borrowed SDS drill worked nicely to drill through the basement floor. Floor drain was sealed with a easy to install Dranjer radon proof drain. I siliconed a round piece of plexiglass from a local glass shop on our sump basin and sealed it tight with rubber electrical and pipe bushings. I took the time to seal all the openings at the top of the basement cinder block walls with self leveling polyurethane sealant. 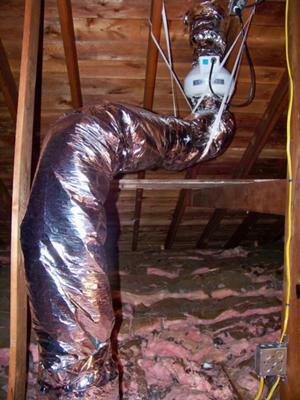 All PVC pipe in the unheated attic are well sealed with flex duct insulation to reduce condensation . Lake effect snow can accumulate on our roof, so I exited the roof fairly close to the ridge. We are delighted with our post-mitigation radon results of less than .4 pCi/L ! The work took about a month of weekends to complete but saved us several hundred dollars. 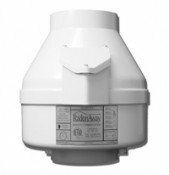 I recommend Val's advice and products to those considering a radon mitigation system.